A top-to-bottom walkthrough of Ember is provided at http://emberjs.com/. I’ve read through that page a couple times, yet I learn best by examining working code. 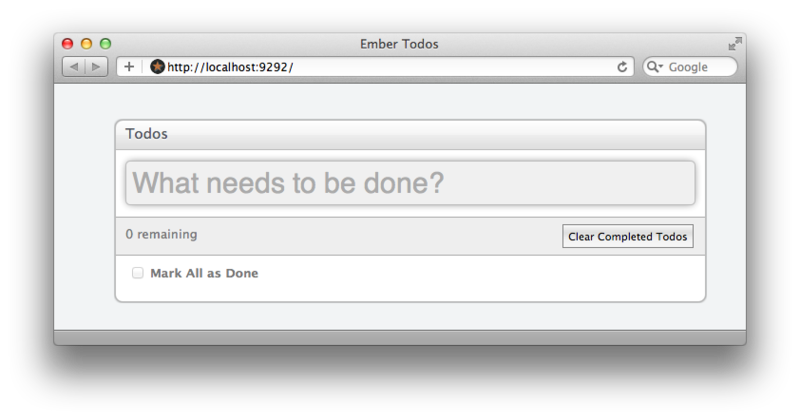 In this series of posts, I perform an examination and walkthrough of an Ember demo app. The authors of Ember provide several demo apps. The simplest is the Todos application (source code). Using ruby 1.9, the steps below will create the Todos app locally. Go ahead and play around with it. Learn how it works. I’ll wait here. When you’ve had your fill of creating and completing Todos, come back and in the next post, we’ll take dive into the code behind it as a way to introduce ourselves to Ember.